Ola, j’ai rejoins l’aventure Noa Trail via Remy Rasse qui s’occupe du réceptif sur le NOA. J’habite Salta, un beau point de départ pour mes sorties trails. J’ai exploré toutes les traces du Noroeste et aujourd’hui je vous propose mes plus beaux tracés. Avec vous pendant tout le voyage, je suis toujours aussi friand de votre accent inimitable. “Ce séjour sportif fut riche en émotions ainsi que le partage de ces bons moments avec vous tous. “J’ai passé un excelent séjour à vos côtés, j’appréhendais un peu une insciption seule à un voyage comme celui-là, mais je suis plus que ravie de l’avoir fait, de vous y avoir rencontré et d’avoir partagé ces bons moments avec vous tous. Muchas gracias! “Aussi quand le Noa trail propose une étape courue au sein même d’un vignoble, le vigneron-trailer que je suis (amateur dans les deux cas, la comparaison avec François D’Haene s’arrête là !…) applaudit des deux mains. Habituellement, la présence d’une vigne me donne des ailes mais à Cafayate, le vignoble grimpe jusqu’à 2200 m, alors ça vole pas vraiment. Les verres partagés avec une bande aussi joyeuse que celle que j’ai eu le bonheur d’accompagner sur le Noa Trail sont tout ça fait un merveilleux souvenir. Allez, Santé et à bientôt pour de nouvelles aventures ! We take you to the Northwest of Argentine, a little-known region by travelers and yet certainly the most diverse region of the country. There is a harmonious combination of nature, history and cultures strongly anchored that we seek in all our trips. A discovery of the Amerindian culture in the splendor of the landscapes of the Cordillera of the Andes, scenery of our race: snowy summits, arid and colorful mountains, plains full of cactus, deserts of red soils or fertile valleys with luxuriant vegetation. These landscapes will serve as the racing scenery. Two formats are possible, either 50 km in 6 stages (trekking or running) or 90 km in 6 stages (running only). Our race will take place mainly in the two main provinces of the “Noroeste Argentino” of Salta and Jujuy which offer an incredible range of colors and landscapes. From Salta, we will follow the road RN 68 to Cafayate which crosses one of the most beautiful landscapes of the country. It will be our first stage: The Quebrada de las Conchas. A long canyon which fluctuates between 1500m and 2000m of altitude and dug over time. Geological strata have been sculpted by the water and the winds which gives a surreal rocks landscape. An extraordinary rendez-vous with nature! The small town of Cafayate (2500 inhabitants) will then be our base camp for two nights and the second stage of the race. Surrounded by the Andes at an altitude of 1660m and encircled by magnificent vineyards, this peaceful village and its central area reminds the atmosphere of a small town in the south-west of France. Then, we will drive to Cachi through the famous Calchaquies Valleys, following the well-known “routa 40” which crosses the whole country from north to south over more than 500km. These valleys, one the most important pre-Hispanics sites of the country, owe their name to the Calchaquian Indians who resisted during a century to the Spanish Colonization. The landscapes are breathtaking, especially in the Quebrada de las Flechas. One of our overnight stopover will be in Cachi, at an altitude of 2280m. White houses here and there under the Andean light. A sweetness found deep down a soothing valley. A welcoming small town built at the bottom of the Nevado, whose summits exceed 6000m of altitude. Cachi will be also the playground of our third stage with a splendid itinerary up above the village. We will then go back to the province of Jujuy, after an overnight stopover in Salta. For the fourth stage of the race, expect a total change in scenery! The Yungas, tropical moutain forest. More precisely, our track will be located in the forest and the lagoons of Yala at more than 2000m of altitude. Altitude, humidity, temperature and reliefs give birth to an exuberant vegetation where giant trees intermingle with lianas, ferns and epiphytes. An ecosystem of great biodiversity. Then, we will go back up to the famous Quebrada de Humahuaca, where colors change as time goes by. Crossed by the Rio Grande, the Quebrada offers an immense archaeological wealth such as Pucaras (military constructions), antigales (Incas cemeteries) and sites full of cave paintings. The Quebrada of Humahuaca has been classified in the World Heritage by UNESCO in 2003. The colorful mountains around Purmamarca will be the magical setting of the fifth stage of the race. Finally, it was impossible not to visit the Puna, a desert area composed of lagoons, dormant volcanoes and seas of salt; and especially its famous Salinas Grandes. A sixth (and short) stage in a lunar setting that you will never forget! Visit of the wine cellars and Piattelli Vineyards, relaxing time around the pool of the hotel (option 1) or transfer and visit of the Ruins of Quilmes (option 2). This program is provided for information purposes only. As mentioned previously, the “Noroeste Argentino” is an incomparable beauty and an incredible cultural richness. It would be a pity to visit this country only via the race angle, even though the race itinerary will take you to amazing places. The Argentinian north-west, straddles between the tropic of Capricorn, the borders of Chili, Bolivia and Paraguay, is characterized by astonishing landscapes; by the existence of intriguing cities, the result of a mix up between the Amerindian and Hispanic cultures, by the rich archaeological history, by the persistence of traditions, rituals, crafts and gastronomic culture. Contemplate the extraordinary nature of this region is the first touristic activity of the trip! The one you can live at every moment of the journey. The breathtaking sceneries will make the transfers by bus too short. Not forgetting the sceneries of the Quebrada de Humahuaca, the Calchaquia Valleys, the Yungas or the Salines which will be undoubtedly graved in your memory for a long time. Firstly, we will visit Salta, a large city of 500,000 inhabitants. Founded in 1582 by the Spaniards, Salta is the most beautiful colonial city in Argentina. Witnesses of this period: patrician houses, churches, old convents… A lively and traditional city that you can discover during an afternoon and an evening. Cafayate, near the Andes Mountains at an altitude of 1660m, the city is surrounded by magnificent vineyards and a rich town planning that you will be able to admire. Cachi is surrounded by colorful hills and the Calchaqui River. Cachi retains its peaceful identity where more than hundreds of archaeological sites are protected. The Nevado, with its peak always snowy at 6000m of altitude is one of the treasures that will offer you a unique setting during an afternoon and during one of our night stopovers. Further North, the cities of Purmamarca, Tilcara and Humahuaca located in the famous Quebrada classified in the World Heritage by UNESCO, are also picturesque villages at the bottom of the “seven-colours mountain”. Even if the main purpose of this trip is the race in the Argentinian Noroeste, you will not leave Argentina without a walk around in the streets of Buenos Aires. The first day of your stay is dedicated to a quick overview of the city thanks to a City Tour in the afternoon. Stops are organized to visit the Boca district (and the colorful district of El Caminito) or the Ricoleta cemetery where Eva Peron rests in peace. This day is free, so that everyone can make its own program according to his/her desires: visit of museums, shopping, or simply stroll as you wish and at your own pace. Nevertheless, at the end of the day, we meet in the lively area of Palermo Viego for an evening on the theme of Tango. Those who still have energy will be able to discover the famous milongas where the inhabitants of Buenos Aires gather to give themselves up to their national passion for the dance. Buenos Aires takes its roots in the tormented past of Argentina and combines cosmopolitanism and nostalgia. Buenos Aires is a prosperous European-style metropolis where formerly, beautiful tango halls mingled with cafés. The capital suffered in turns from the military junta, inflation and a succession of economic crises. However, nowadays, the city seems more alive than ever thanks to a dynamic and talented young generation that makes Buenos Aires a very trendy destination. 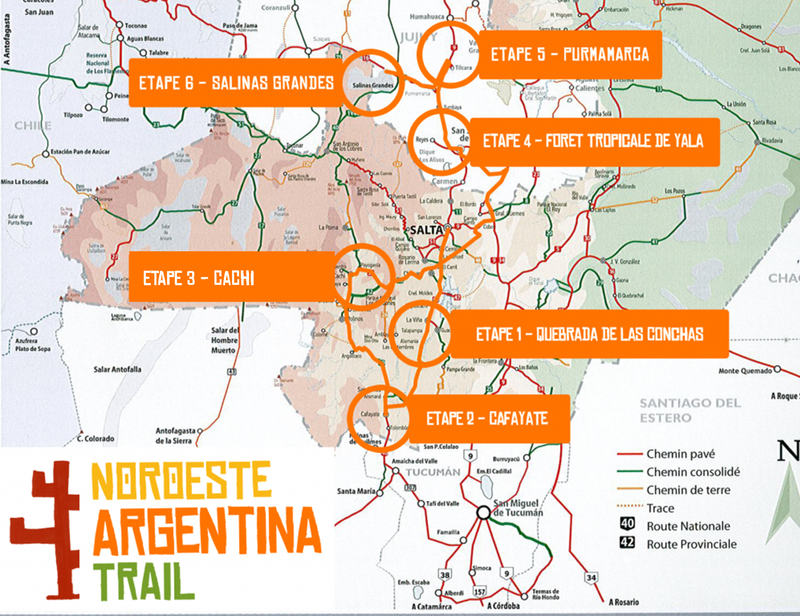 The Noroeste Argentina Trail is a 5 stages race. A training and acclimatization session is also organised. All the participants must be aged of 16 years minimum and have a medical certificate of no contraindication to the practice of running in competition. The markings will be done with stakes, biodegradable soil bombs and/or ribbons attached to the vegetation. Three or four staff members will be positioned along the route to guide participants and ensure the safety of the group. Provisions of water and fruits (dried and fresh fruits) will be available on the finish line. Participants will have to come with gourds (attached to belts) or camelbacks which they will have to fill with water at the start of the races. It is also highly advisable to bring gels and/or energy bars. A medical team, including an ambulance, a doctor and all the first aid medical equipment necessary to the organization of a race in competition will be set up on every stage. The journey between Paris and the Argentinian North West will take place in two stages: Madrid – Buenos Aires – Salta. You will stay in 3* or 4* star hotels. The hotels are basic but with fairly good quality. Participants will be accommodated in a double room (for couple) or in a twin room (two single beds) for individuals. All the hotels have a Wi-Fi access, a swimming pool or even a spa. Depending on the number of participants and because of the limited capacity of the Argentinian hotel structures, the group might be divided in two different hotels, in particular in Tilcara. The gastronomy is one of the cornerstones of the Argentinian culture. Meat is the main element of Argentine cuisine. Vegetable are usually used to decorate the plate! You will not leave Argentine without having discovered the famous “asado”: meats cooked with embers. A true Gauchos traditional dish. Not forgetting the unmissable ’empanadas’, sort of puff pastry filled with beef, cheese, chicken or corn. Of course, we grant a great importance to offer varied and balanced menus. Breakfasts will be served at the hotels. You should be aware that breakfast is not the specialty of Argentinian hotels. The menu is quite simple and the salty ingredients are often limited to a slice of ham. However, the orange juice is fresh and excellent! Depending on the program and the duration of the transfers by bus, lunches will be taken either in restaurants near the finish line of stages or in the form of picnic. Most of the time, dinners will be taken in restaurants of the towns where we stay for the night. Except for the water (still and sparkling), the other drinks (sodas, beers, wines) will be charged to participants during meals. In order to also enjoy your trip as you please, some meals will be free and at your expense: second dinner in Cafayate, third dinner in Tilcara and the last lunch in Buenos Aires (see program). The organization if covered by a civil liability insurance. Nevertheless, all participants must have a repatriation insurance. If you do not have one (especially as part of your carte visa premier), we can propose you one. The cost corresponds to 3% of the total cost of the stay. 2h flight between Buenos Aires and the provinces of Northwest Argentina (Salta or Jujuy). A valid passport is required to travel to Argentina. Argentina offers a wide range of climates. It can get very hot in the Argentine Northwest. In November, the temperature should vary between 20 and 30° in the middle of the day with a dry weather in altitude but a wetter heat under 2000m, especially in the Yungas. Temperatures can drop below 10° early morning or early evening due to the altitude. Although the rainy season is between December and February, water drops and even thunderstorms are not to be excluded at this time of the year. Do not worry, the morning schedules of the races and the presence of swimming pools in every hotel will make these heats bearable. Argentina is a country with little public health risk. No vaccine is required. It is simply advisable to be up to date with ‘universal vaccines’: diphtheria, tetanus, polio, hepatitis B. It is also advisable to be vaccinated against Hepatitis A and Typhoid fever. No special medication to bring. However, think about aspirin in case of headaches for those who are sensitive to altitude. A lot of over-the-counter medicines are available in pharmacies. Although the euro and especially the dollar are currencies of reference for Argentines, it is recommended to pay in Argentinian pesos which is the national currency. It is represented by a $ in the country while the dollar is represented by the symbol US$ or USD. Credit cards are accepted fairly easily in every city we pass through. However, shops often charge you an extra cost if you pay by card. Better to pay in cash when possible. It is quite easy to find cash machines. You are allowed to enter the country with a maximum of 10,000 US$ which is more than enough to charge your consumptions and make some souvenir purchases. In restaurants, service is generally not included. It is customary to add 10% of the bill if you are satisfied with the service. The person who will carry your luggage at the hotel will also appreciate a small gesture of 5 pesos. Mobile phones work with the International option (depending on your operator) but is quite expensive. Outside Buenos Aires, the network is not always good, especially when we are in cities surrounded by mountains. To be called from France, your family and friends have to dial 00 54 + your telephone number without the 0. In the hotels, the internet access works quite well. You are allowed to bring only one large suitcase (-23kg) and a hand luggage (-12kg) in the cabin. your complete running equipment, warm technical tee-shirts, a warm jacket and a Gore-Tex jacket against wind or rain. Ideally, 2 pair of trail shoes: a ‘classic’ pair and a pair more adapted to the mountain with strong soles and thick protection. For accompanying persons who wish to walk on short distances, a pair of hiking shoes recommended. You also have to take a running backpack (camelback) or a belt with bottles of water. For the touristic activities or free times, keep in mind that the mornings and the evenings can be cold. Do no bring only t-shirts! Add one or two sweaters or fleece and windbreaker. Do not forget to protect yourself from the sun and heat: sunscreen, lip stick, sunglasses, cap, neck protection, etc. The total number of participants in 2019 is limited to 40 competitors, split between the 50km and the 90km. The registration is now open till the 15th September 2019. A single price is fixed at 3690 euros per participant over the period. Participants will also have to pay enrollment and online payment fees which represents 1% of the total cost of the stay, 36,90€. Executive staff (about 10 people) for the organization of the trip, the race and touristic activities. Catering during the entire stay, except two dinners (Cafayate and Tilcara), one lunch (Buenos Aires) and two meals at the airport (dinner 09/11 in Salta and lunch 19/11 in Buenos Aires). The registration fee is the same for accompanying persons (over 16 years) who will benefit from most of the services listed above. Accompanying persons are allowed to walk on the 50 km. As the total number of participants is limited, the organisation will retain files according to the places available and will accept only complete applications before September 2019. Two dinners (Cafayate and Tilcara), one lunch (Buenos Aires) and two meals at the airport (dinner 09/11 in Salta and lunch 19/11 in Buenos Aires). A medical certificate dating from December 2018, at the latest, of non-contraindication to the sport in competition (optional for walkers or the accompanying person).